This is the story of a year I spent in New York, studying with Yoga Master Alan Finger. It turned out to be such a life-changing experience for me that I asked Alan if I could write a book about it; I wanted to share with other women what I had learned from him and help them to make the same kind of important discoveries about themselves that I did. The book is written as a series of conversations on topics of importance to today’s woman, and at the end of each chapter there is a breathing exercise, selected by Alan from his immense storehouse of yogic knowledge, and reinterpreted for a modern audience. The exercises in the book will, over time, help you to create space in your body and mind, and release your imprisoned self. Breathing Space has been featured in Elle, Yoga Journal, Body and Soul, and Fit Yoga. For other countries, please check with your local retailer or order directly from the publisher. Would you like to be initiated into one of the closely guarded secrets of the ancient yogic masters? Learn to balance mind and body, head and heart-and start to bring about those changes in your life that will lead you to personal happiness? Then you need to discover the hidden world of the chakras. 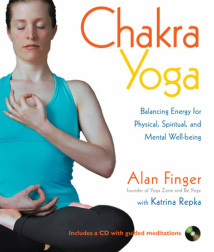 Chakra Yoga explores the seven major chakras, each of which governs specific aspects of the body and mind. Integrating the chakras into your yoga practice will accelerate the process of personal transformation. For all queries regarding book, film, and other rights worldwide, please contact my literary agent Jennifer Lyons on jenniferhlyons@earthlink.net.